A Php500 welcome gift voucher is given to new DLSAA MasterCard cardholders. The gift voucher may be used to purchase DLSAA merchandise or as payment for DLSAA membership renewal. *Limited to new principal cardholders only. Renewal, replacement, and converted cards are not eligible under this offer. Terms and conditions apply. EastWest will donate Php1,000 to DLSAA, in your name, upon reaching your first Php2,000 spend. Your donation shall be used to fund DLSAA's various projects which will help change lives of individuals. 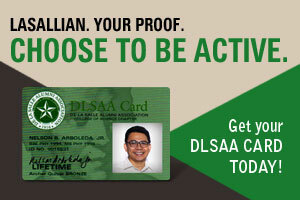 Get 5% discount on DLSAA merchandise when you purchase using your DLSAA MasterCard at the DLSAA Office in DLSU-Manila. Earn one (1) Rewards Point with every Php100 charged to your DLSAA MasterCard. You may use your Reward Points to donate to DLSAA projects, exchange for cash rebates or get Annual Membership Fee waivers. As you travel within the Philippines and around the world, you may use your DLSAA MasterCard in more than 30 million establishments, in over 200 countries wherever MasterCard is accepted. You have the option to pay the total statement balance, the minimum payment due, or any amount in between on your payment due date. Should you opt to pay an amount less than your total statement balance, an interest charge will be applied. Get cash advances of up to 50% of your credit limit at any EastWest ATM, over-the-counter at any EastWest store nationwide or at any ATM displaying the MasterCard and Cirrus logos. Cash advances can be availed using your unique Cash Advance Personal Identification Number (PIN) and an interest charge will be imposed from the date of availment to the date of full settlement or payment. Transfer your other credit cards' balances to your DLSAA MasterCard and enjoy great savings and lighter monthly installment payments. Have the option to convert your high-ticket, shopping and travel expenses to installment payable in 6, 12, 18 or 24 easy payment terms at low monthly add-on interest rates. Take advantage of the most convenient way to pay for your utility and telecommunication bills, and insurance premiums with billers such as Bayantel, Digitel, Globe, Meralco, Philam Life, PhilPlans, PLDT & MyDSL, Red Mobile, SKYCable, SKYVoice & SKYBroadband, Smart & Smart Bro, and Sun Cellular. Simply enroll in the Quick Bills Facility and your bills or insurance premiums will be automatically charged to your DLSAA MasterCard. This means no more rushing to payment centers and waiting in long lines. To enroll, please call EastWest's 24-Hour Customer Service at 888-1700 or 1-800-1888-8600 Domestic Toll Free. Share your spending privileges with your loved ones by giving them Supplementary DLSAA MasterCard. You can request up to 9 supplementary cards. You may also assign a monthly sub-limit* for each supplementary card to better manage your finances. *Remains the same monthly for as long as the Principal Cardholder has an available credit limit. Call 888-1700 or 1-800-1888-8600 Domestic Toll-Free for card inquiries, lost card advice or Balance Transfer, Convert-to-Installment, and Supplementary Credit Card applications.